I’ve always prided myself on my clean PG-13 vocabulary. I’m just not a curser. I don’t think it’s very ladylike. Plus my Mom raised us not to curse. But lately, over the last 6 months or so things have changed. I’m not proud of it. I’m cursing like I’m getting paid for it. I even curse in my head! 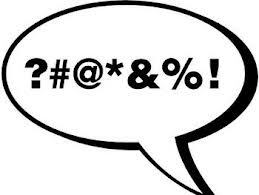 And not just the PG-13 cursing- I’m talking F bombs here. It’s terrible! I don’t know how to cure myself of it! I sound like a drunken sailor! And I’m not a very good curser either since I don’t have a lot of experience, much to the delight of my husband. CSP is always laughing at me when I try and put together a couple of curse words to zing him with. It’s no laughing matter! I can’t be raising a bunch of foul mouthed children! Guess I better go wash my mouth out with soap! You are a grown up, you are allowed to say “grown up words”. As long as you done say the F word to a bank teller or the clerk at CVS you are fine! We’ll have to control our potty mouths before the kidlets come home! !